Expand your business with multilingual marketing translations. Marketing professionals know the importance of consistent messaging that speaks to prospective customers and builds loyalty with current customers. You spend time doing market research, creating messaging, and developing product names, company slogans, visuals, and packaging to resonate with your target customers. When taking your product to an international audience, or to limited English speakers in the U.S., you want the same amount of care in branding and messaging, so that the new audience has the same experience and impression of your goods and services. "Marketing Translations tips & Considerations"
Our linguists understand the complexities of creating and marketing consumer products. We specialize in capturing the meaning in order to cater to the target audience and make a product and its message culturally appropriate. We pay close attention to idiomatic expressions and cultural references to make sure that your products appeal to your multilingual customers. We convert your audio and visual materials into any language so you can still harness the power of visual connection. Whether it is for corporate or customer-facing communications, we translate and edit videos, webinars, audio files, podcasts, scripts and special effects to reach your multilingual audience. Localization is the process of adapting the language, cultural, currency, and technical content into readily acceptable usage for distinct markets. Globalization is the use of one language to convey a message in all parts of the world that speak that language. We work with you to determine whether a global or localized marketing campaign would work better and then we translate the necessary materials appropriately for a successful campaign. Gain a better understanding of how to get high quality multilingual marketing translations. Our proven process of people-focused translations helps you find the best solution for your multilingual communications strategies. Walk through through the steps of your translation project. Curious about the costs of translations for marketing materials? Need to know which factors play a role in timing? Learn more about costs and expectations with translations pricing. 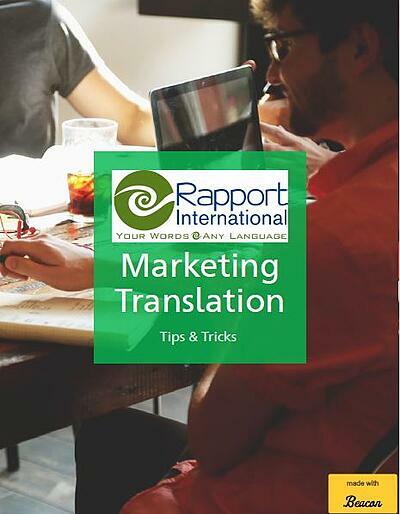 "Our business has increased since we started using Rapport International for our marketing translations. By providing our advertising and print materials in a number of languages, we have seen our products explode internationally. Rapport knows how to make a product applicable and appealing in all languages and cultures." Ready to get started? We will be happy to provide you with a free custom quote for your translation needs.